I know this is maybe not a fair comparison, since Aux Vivres is vegan and Crudessence is vegan, organic, and most importantly, raw, but both have surprisingly similar, meat- and dairy-free menus. The big difference is that Aux Vivres uses an oven, a grill, a steamer and a lot of tofu and beans, while Crudessence doesn't cook a thing, and sticks to fresh or dehydrated vegetables, fruits, seeds, nuts and their oils. So no flour, no beans, no lentils, no rice, and no steamed, boiled, sautÃ©ed, or roasted vegetables, but 'raw' means a whole lot more than salad. Yes, you can use sunflowers to make a patÃ©. Yes, zucchini can substitute for lasagna noodles. No, you don't need to cook sundried tomatoes to make a marinara sauce. So should you go vegan, go raw or stay home? BEST BURGER: Crudessence, hands down. The Om Burger is a tangy combination of sundried tomato, mushrooms, flax and other unidentified vegetables with fresh tomatoes, lettuce, sprouts, shredded sweet red onions, sugar-less ketchup, mustard and caper aioli you'd swear was egg-y mayonnaise. Take that, nayonnaise. The burger actually tastes a little like beef, because of the texture and the flavour of the sundried tomato patty. Served with a green salad of lettuce, carrots, beets, sprouts, a creamy, sesame vinaigrette, mild pickled beets, and the carrot and sesame creation of the day, this is a feast for the eyes and the stomach. Oh, it's served on chapatti. Well, more like thin, nutty bread...it's nowhere near as light and fluffy as the Aux Vivres chapatti, but besides the name there's nothing to complain about in the delicious burger. 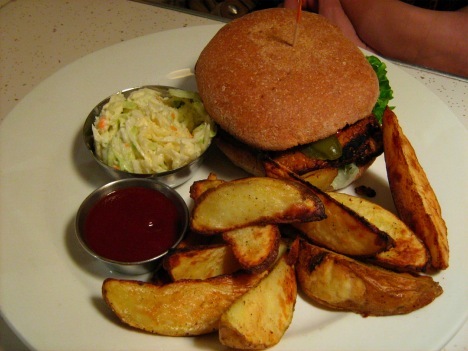 Then there's the Aux Vivres burger...a square of tempeh on a little bun, plus a handful of potato wedges. This is pretty tiny. Sure the chipotle ketchup takes up room on the plate and is basically the highlight of the meal, but the little container of nayonnaised coleslaw does not pass muster(d? ), and takes up room that could be given to something else. Anything else. Then when you actually have a bite of the dry burger...it tastes like...well, sadly, not much. Okay, vegetarians. What do carnivores like about their burgers? They're big and JUICY. Vegans shouldn't have to live with flavourless burgers, like non-vegetarians shouldn't have to live with flavourless pork. 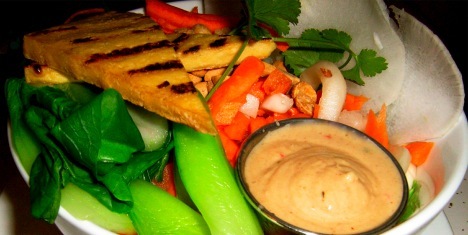 BEST WRAP: Aux Vivres gets it right with the Chana Wrap. A beautiful chickpea and potato curry wrapped in freshly-made chapatti with a very sweet, generically named chutney (it's actually tamarind but apparently the cooks here have never been to Parc Ex where Indian chutney comes in multiple varieties. Mango? coriander?). Anyway, compared to the 'mango chutney' in Crudessence's 'Fleurs de Macadam' appetizer (really just sadly under-ripe mango), this chutney is so good it can call itself whatever it wants. There's something so satisfying about a warm, sweet wrap of comfort. 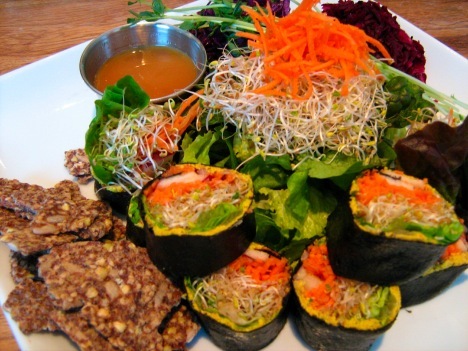 Crudessence serves their wrap in sushi nori or rice paper instead of a flour-based shell, but now you can get the same wrap as actual sushi. Instead of soy sauce, dip the wrapped pieces in fat-Free Tibet dressing. Adorable...but just not as good as the Chana wrap, and the sunflower patÃ© in the sushi starts feeling heavy after a few pieces. BEST JUICE: Crudessence. The fruit is organic, there's no sugar added, there are more milk options (home made coconut, almond, hemp, and macademia nut milks), and there are more exotic ingredients and choices (like maca in the macao - a chocolatey blend of raw cacao, maca, banana and brazil nut milk - or gingko biloba and ginseng with banana, pineapple and mango in the Energy Elixir. This is long-lasting energy. No sugar highs and lows). Even the "healthy" vegetable juices aren't bitter. I swear I really enjoyed the Gaia. 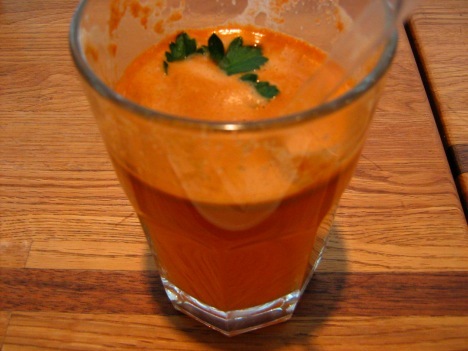 There was enough sweetness from the carrot, parsley and celery, and not too much acid or heat from the lemon and cayenne. BEST SERVICE: Crudessence. Both restaurants get really busy and you can end up waiting for water for a while, but at Crudessence the atmosphere is so relaxed that you don't really care. One person can run the whole floor by herself, and the woman I saw do it, did it with a natural glow and ease. Normally you feel stressed out for busy servers, but despite the cafÃ© bustle, there was a distinct lack of stress. Aux Vivres has a friendly atmosphere too, but it feels more like a business. At Crudessence there was an unique appreciation for the food the restaurant was serving, as well as the overall experience of the customers. HONOURABLE MENTION: Rice bowls at Aux Vivres. Call me a sucker for cooked food, but the rice bowls at Aux Vivres are very good. When I see a rice bowl in a restaurant, I think that it's incredible I'm paying more than $10 for something I could make at home pretty easily. Congratulations, you took a big bowl, put about 3 servings of brown rice on the bottom and topped it with steamed green things, two pieces of heavily marinated tofu, and served it with a high-fat, thus delicious, sauce, but to be fair, a sauce like the good-tasting peanut version at Aux Vivres, takes the right balance of salty and sweet, not too thick, not too thin. You can make good peanut sauce at home for less, though, or buy it...La Vieille Europe would be happy to point you to a good one in their shop...and encourage you buy some sausage while you're at it...and some cheese. Some meat-lovers are incorrigible. So I have a bit of respect for Aux Vivres, despite my rice bowl hesitations. They keep it simple with only a really good sauce + vegetable combinations instead of offering a million mix and match options. That way you can't mess up your own dinner, and they can also actually focus on using unique ingredients, like the pickled daikon and carrots. You really don't expect that hit of sweetness from a radish that sits along the side of the bowl. At most Asian restaurants you'd call that garnish and probably leave it on the plate after you ate the pig or cow part of the dish. The peanut and miso-tahini sauces really hold the whole bowl together. Kudos, though, for putting the sauce on the side so you can add as much as you want. It can get annoying swimming through peanuts to find the few remaining grains of the three cups of rice you just ate. BEST DESSERT: Crudessence. Maybe I'm just disappointed with Aux Vivres because the first time I went there I left the happiest person in world. I had their carrot cake - a towering piece of moist spice cake with enough cinnamon, nutmeg, dates and cane sugar to satisfy any sweet tooth. The icing is what knocked me over, though. It was thick and smooth (may they never change to vegan cream cheese), not like most grainy or seven-minute-fluff frostings, or heaven forbid, Betty Crocker. So when I went back a 3rd time I felt like I was testing the waters of my relationship with the carrot cake. I could forgive it if it could give me what I wanted (gigantic layers of spice enrobed in dense sheets of orange-free icing. No compromises). All of a sudden, with no change in price, the carrot cake had shrunk in half, the icing was more like a peasants' whisper of white than a respectably royal sugar onslaught. So I cried a little inside and tried the Choco-Banana Pie instead, unable to bear more disappointment. For a tiny slice of tarte, I don't think the pie is worth the high price tag (over $5), but it was very good. Somehow the chocolate and banana became perfectly smooth, like a chocolate cream pie...without the cream and apparently also completely soy-free. Still, Crudessence wins with its avocado key lime pie ($5.25) and Blueberry gateau fauxmage ($6.75!). These are so rich that you could make a meal of them, despite the small size of the pieces. 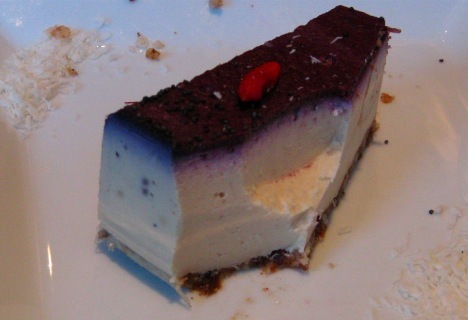 The fake cheesecake is made with a mixture of nut butters and topped with a refreshing blueberry glaze. 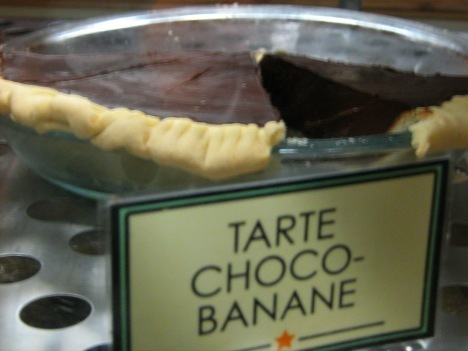 It doesn't melt in your mouth like Aux Vivres' Choco-Banane, but you wouldn't want it to disappear so quickly. Aux Vivres' Fauxmage just doesn't compare to Crudessence's. It's easy to look at all the yellow and get turned off, but Crudessence's cake appeals to a much wider audience. You don't eat there just because you're vegan. You eat there because it's a very good restaurant with very good food. 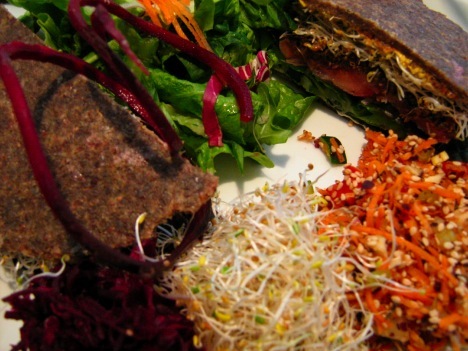 MontrÃ©al has quite a busling vegetarian and vegan scene. Lolla Rossa is really worth checking out too. Their desserts are just to die for. Anyone who hasn't had vegan desserts, done well, they're a much better experience that standard ones! I completely agree with Richard on the vegan dessert part - they're lighter and tend to be much easier on the stomach, but they still satisfy the cravings. Lola Rosa's key lime pie is probably the best thing that ever happened to me! Although I personally prefer Aux Vivres, I also prefer my food cooked, not dehydrated, so I think it boils (pun!) down to taste. You're killing me with the key lime pie! As much as I love Crudessence's Avocado key lime, I'd love to try Lola Rosa's. Do you know if it's dairy-free? Soy-free? Unfortunately the restaurant itself isn't dairy-free, so I haven't had much luck there. Lola Rosa is good for anyone around the McGill or downtown area hunting for a vegetarian lunch, though. ya i find aux vivres to be kind of whatever. the time i waited 2 hours for a meal there kind of soured me. Though, having a nut allergy myself, I am hesitant to try these places. Reading your descriptions of the meals does not help that fear! I assume the staff would be helpful with my allergies, however with everything having a peanut sauce, or a nut bread, I am still very hesitant. Otherwise, the dragon bowl at Aux Vivres may be nut-free, and I would think also the chana wrap. There would definitely be more options than Crudessence. Just check with the servers. Traces of nuts may be in more of the dishes than the servers know, though. I'm just going to chime in and say that despite the delicious key lime pies you guys are talking about, there's something decidedly wrong (read: not tasty) about vegan brownies. Some things are just supposed to have butter and eggs in them. Amie, I'm not sure for Lola Rosa... Happy Cow describes it as "Ovo, Lacto, Vegan-friendly, Organic, International" so... I guess? Margot, I so completely and utterly agree with you. A brownie without butter and eggs is just chocolate... something - still good, but not a brownie! I went on a mission to Lola Rosa to find out once and for all if their key lime pie was vegan and better than Crudessence. Turns out it's not vegan! There's egg and milk in it, probably making it delicious for the same reasons brownies are definitely just chocolate without butter and eggs. Had a great chat with the staff there, though, and I got to try their only vegan dessert - a chocolate cake topped with walnuts and a raspberry coulis. The cake had dairy-free chocolate and oil as its base, so it was light and a little chewy, and the top was really nice with the walnuts. Even the raspberry was tart and refreshing, but it just wasn't the rich chooclate-y taste you want from cake (or brownies), despite using pure chocolate instead of cocoa. The very accommodating guy there swears the cake is not their best dessert and the key lime is much better, but unfortunately not vegan. So Crudessence definitely still has the best vegan key lime, both by default and because it's amazing, but if you're a lacto ovo vegetarian, or an omnivore, give Lola Rosa a try. It's worth checking out for the good people working there. 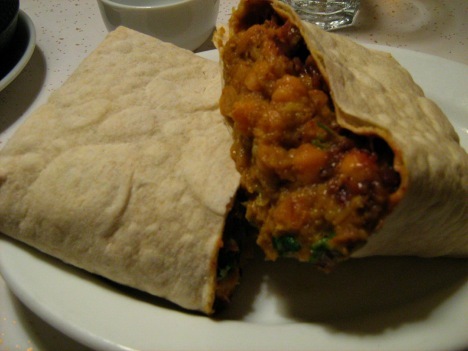 Although I've been disappointed by Aux Vivre's desserts, the chana wrap was so good that it more than made up for it. Just wanted to put that out there - it's amazing. Crudessence DOES have a raw carrot cake, and like all their other desserts, it is to DIE for. But if you really want to perish of ecstasy, try their pecan pie with a pot of nettle tea. Both places are great. i have to agree. But my fav vegan (most things can also be gluten free) restaurant is Bonny's on rue Notre-Dame...near the salvation army super store. they are such a wonderful hidden secret. the prices are great and the food is unbelievable. They always have fresh new deserts, soups and a daily special. You should visit and write a lil' thing on them. the bonny's secret needs to be let out. Thanks for the heads up! I've been meaning to check out Bonnys, so I'll be interested to see if it's as delicious as it sounds. I love a restaurant with integrity, and this place certainly seems to have it. It also looks like it would fit right in with the other eco-conscious restaurants that Cycle Bird Bike Courrier works with, so I (and you) could post under that article on Midnight Poutine as well (http://www.midnightpoutine.ca/food/2010/03/montreal_bike_courier_offers_meal_delivery/#comments), to let the owner of the Bike Company know about it. You're very right that a good secret should be let out. Wicked. I'm going to Montreal next week and will enact my own Aux Vivres vs. Crudessence cage match. Yes, that's a great idea! I'd love to hear what you think! Have a great trip. Aux Vivres will always win in my books. I got sick from this raw lasagna I ate at Crudessence, and it was really expensive . Aux Vivres has improved so much over the years and it's still amazing value. You got sick? Were you allergic to something in the food? Or was it past its prime? They're usually very good about food safety, since no bacteria gets cooked off, things get fermented, and they have to be careful. I often have problems at Crudessence because there's a lot of coconut in their dishes (not the lasagna) and my body doesn't like when I feed it coconut. A lot of people also have trouble dealing with the heaviness of the nuts. I know I've personally tried to eat a double portion of the lasagna once and felt awful for a long time, but that was completely my fault. Ahahaha I'm vegan and I eat 80% raw food ...All I can say is that "Aux Vivres is so much better" !!.. 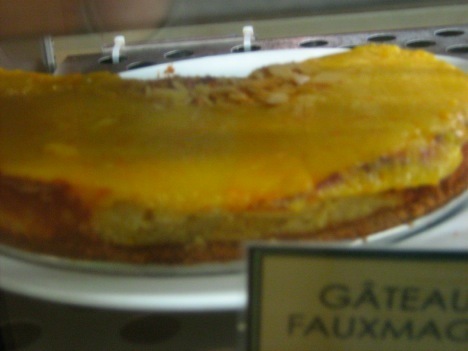 You must try the new cheese cake, it is so much better than the old one. It is off the hook. Anyway, I want all of the vegan places in Montreal to do well, and serve us fresh food. I will always love Aux Vivres but I still might give crudessence another shot sometime. 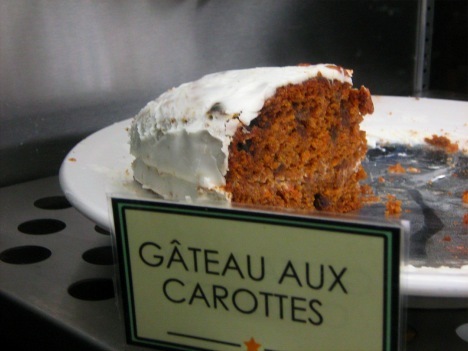 You know I was actually there the other day to give Aux Vivres carrot cake another shot and it got even worse! They changed the icing recipe and now it's more like slightly citrus-flavoured whipped cream. The cake itself it just as mediocre. I haven't tried the fauxmage in awhile, though, so thanks for the heads up, Jim. I did try their chipotle cinnamon brownie, though, and was pretty impressed. It's about the size and density of four brownies and it's iced, which is so important. The chipotle was only a subtle after-taste, though, and I couldn't even taste the cinnamon, but still it was much better than the carrot cake. am following you. Look forward to finding out about your web page for a second time. auprès fabriquer de même ? Exhaustifs ces codes promo Boulanger répertoriés et négociés dans l’équipe Poulpeo sont disponibles sur cette verso. nouveaux codes réduction Boulanger, avec irrécusables exclusivités réservées à Poulpeo. votre allié malgré dévaliser cette sac! cash + seul gratification jusqu'à 500€ grâce au Code Promotion Va-tout PROMO515 sur CDPoker. What's up, I desire to subscribe for this web site to obtain latest updates, so where can i do it please help. I really eyenojd reading your MoFo posts and will keep on reading your blog.That running challenge looks quite interesting I think I'm going to get myself a watch so I can keep track of time. I hope I'll take the challenge, anyway. augment or even I fulfillment you get entry to constantly rapidly. Thank you a bunch for sharing this with all people you actually recognise what you're speaking about! I think that what you said made a great deal of sense. But, what about this? what if you were to write a awesome headline? I am not suggesting your information isn't solid., but what if you added a title that makes people want more? page and watch how they write article titles to get people to click. get readers interested about what you've written. Just my opinion, it would make your blog a little livelier. I Wonder how the restaurant "Copper Branch" would measure against these two. The food there is amazing. 1? ????????2008??15%??????30%??????????????????????????1772???????????????? ?? 353. ??????????????5???????????????????????????? 2? ??????????????????????????????????????????????????????????????????????????????? ??????????“???”??????????????;????????????????;???????? ???"Emcore?????????????????????5?1???????????????????? ??????????????????????????????????????????????????????????????????????????????????????????????????????,??????????18. If you've got an ink jet printer Afterward You are likely spending a great deal of money on ink. The majority of these printers use complicated and expensive. These capsules track use and estimate the quantity of ink remaining. The estimate is usually conservative, meaning it suggests you are out of ink until you're really out of ink.Should you reset this memory then you can keep|} Printing before the cartridge is actually empty. Based on the brand and model of cartridge, this reset is really really easy. If you look above the little circuit board onto the cartridge, then there is sometimes a pinhole reset button, kind of like the paperclip eject hole on many cd rom drives. As a way to use the resource on the expanding info in international trade, we welcome prospects from everywhere on the web and offline. In spite on the high quality objects we offer you, effective and satisfying consultation service is supplied by our qualified after-sale service group. Item lists and in depth parameters and any other info weil be sent to you timely for the inquiries. So you should make contact with us by sending us emails or call us when you've got any questions about our organization. ou could also get our address information from our site and come to our enterprise. We get a field survey of our merchandise. We're confident that we are going to share mutual accomplishment and create solid co-operation relations with our companions within this market place. We're seeking forward for your inquiries. We, with great passion and faithfulness, are willing to provide you with perfect services and striding forward with you to create a bright future. At present our sales network is growing continually, improving service quality to meet customer's demand. If you are interested in any products , please contact us at anytime. We are looking forward to forming successful business relationships with you in near future. With the enterprising spirit of" high efficiency, convenience, practicality and innovation", and in line with such serving guidance of "good quality but better price, " and "global credit", we've been striving to cooperate with the automobile parts companies all over the world to make a win-win partnership. We are willing to cooperate with business friends from at home and abroad and create a great future together.